Ramen is an enormously popular noodle dish in Japan. True comfort food, which is sold on every corner of the street, freshly prepared or in an instant form. In Tokyo you will even find a museum ‘Shin-Yokohama Ramen Museum’ which is completely dedicated to the history of ramen and the big success of instant ramen. Ramen noodles are in generally made of wheat flour and if you can get your hands on fresh ramen noodles, scrumptiously delicious. The taste of the ramen depends on the soup you serve them in. In this recipe I used my grandmothers chicken soup recipe, which you will be able to find on the site as well. If you are in a rush then please, choose the best chicken stock base you can find in your supermarket. Heat the chicken stock in a pot. Once boiling reduce the heat simmer for a few minutes on low heat. 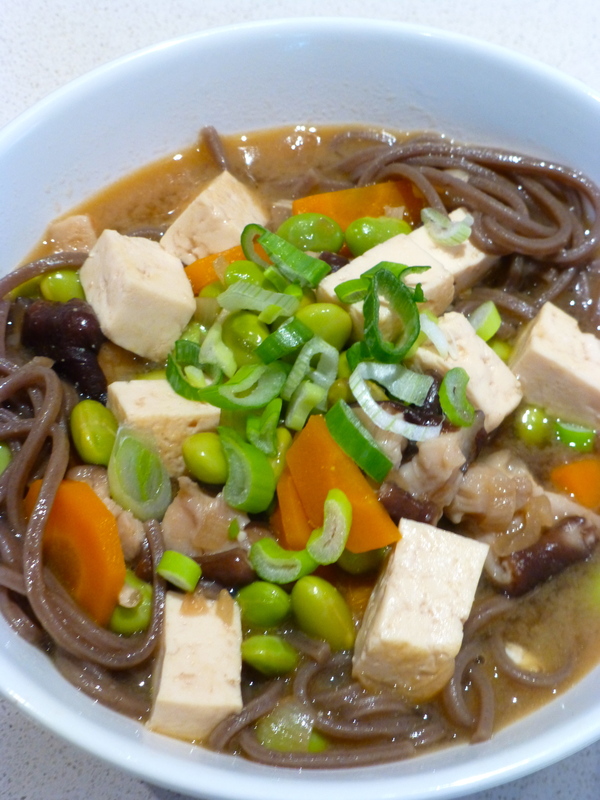 Scoop out one large ladle of soup and dissolve 4 tablespoons of miso in it by whisking it to a smooth consistency. If you try to dissolve the miso in the soup directly, it might clump together. Once the miso is dissolved return it to the broth and simmer for a few minutes but be careful not to boil the soup after adding the miso. Boil the eggs and cook for 5 minutes. Rinse them with cold water and allow the eggs to cool down before peeling and slicing in half. Heat one tablespoon of sesame oil in your frying pan and add the corn. Stir and fry the corn for a few minutes and set aside. Boil salted water and blanch the spinach for 2 minutes until just wilted. Drain immediately and set aside. Roast one tablespoon of sesame seeds in your frying pan and set aside. Slice the green onions and set aside. Last step of the preparation is to cook the ramen noodles. If you have fresh ramen noodles you will only needs to cook for 1 minute, drain and rinse with cold water. Take four large serving bowls and place the ramen noodles in each bowl. 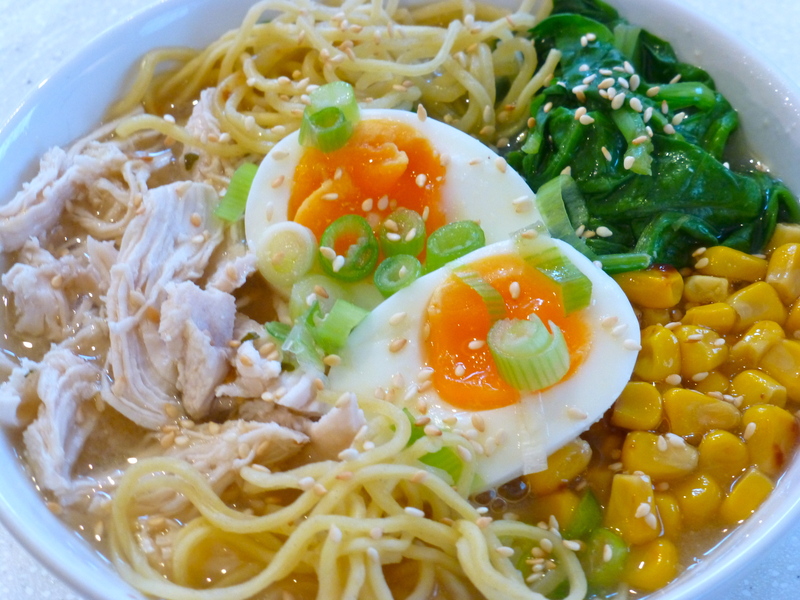 Now top the ramen with spinach, corn, shredded chicken and egg. Sprinkle the roasted sesame seeds and the green onion on top. This wonderful soup is one of my favourite lunch dishes. It’s healthy, hearty, quick to make and also great if you fancy a light dinner. The ingredients really work well together, but this soup also allows you to replace some of the ingredients with your own favourites. If you have a piece of chicken or firm white fish in the fridge which you like to use instead of the salmon, or replace the spinach with for instance bok choy then by all means do. When it comes to the oil, I do love to use the toasted sesame oil. If you don’t have it at home then please buy it and give it a try. It is great for stir frying and makes a beautiful salad dressing too. If you want to make my day, then please use the fresh mint on top. I know that cilantro is very popular as well with these kind of dishes, but I promise you that mint is such a lovely component of this soup and makes it even more yummie. If you prefer to have this soup as your main meal, you may want to use one salmon fillet per person and use a larger portion of udon noodles. I hope you enjoy. The first thing to do is to marinate the salmon. To prepare the marinade, mix the sesame oil, soy sauce and honey. Place the salmon in a shallow glass or plastic dish, pour marinade over salmon, cover and refrigerate. Allow to marinate for at least 10 minutes, preferably for 30. Slice the shiitakes and spring onions. Roughly chop the fresh mint leaves, as it will release its gorgeous aroma and flavor, and if required wash the spinach. Cook the udon noodles as stated on the package and rinse with lots of cold water and drain. Set the noodles aside. Pour the chicken stock into your stock pot and bring to a boil. Add the red thai curry paste and stir. Simmer for 5 minutes and then add the shiitake mushrooms and the fresh spinach leaves. Simmer for a few minutes and season with the soy sauce. In the meantime, start grilling your salmon in the grill pan. Don’t forget to use one tbs. of sesame oil, even though it is marinated as it might stick to the pan otherwise. Grill the salmon on both sides until browned but still a bit pinkish inside (about 4 minutes each side). Once removed from the grill pan, cut the salmon into flakes. 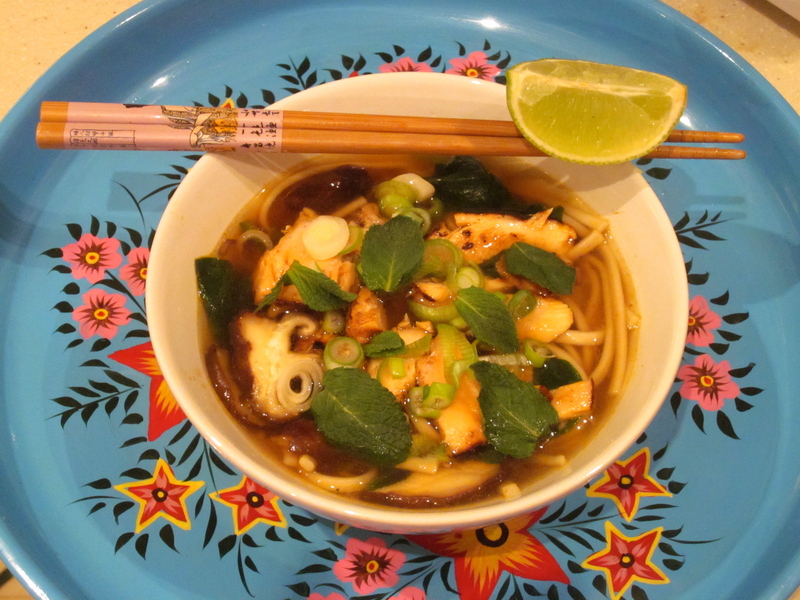 Divide the noodles into the soup bowls, ladle the soup on top, add the salmon, sprinkle the spring onions and chopped mint on top and serve with a piece of lime.